Paying Ready Attention: Looking for autumn – a year on year story. Looking for autumn – a year on year story. Normally it comes with a rush. Sharp storms, hard winds and the tittle tap rattle of leaves on darkened windows. But this year it’s different. Summer lingers beyond its welcome. Nights that should be cool and cosy stay garden drinks warm. The wasps remain. Bees still buzz around the flowers of the rosemary, extending the BBQ season. The tomatoes have gone, but that was my decision rather than the weather’s. The garden glows with a post summer green that you normally only see in real estate posters and over saturated post cards. But it’s out of place, after a hot summer – a record or so we are told – I look forward to the chill pleasures of autumn. The world seems to have stopped spinning – the swallows, the bright coloured leaves, the teacher, teacher, teacher of the woodlands’ edges, the call of the currawongs, they all seem to be held in transit somewhere, sometime. The accustomed markers do not come and we wait and wonder why. Weather? Climate? Simple bad luck? Or a strange combination of highs and lows that block here and push there, causing lingering warmth or clinging cold. But whatever the cause and whatever the appropriate response, autumn seems late And when we wake on the first day of the holiday I am still waiting. Waiting. Waiting. Waiting. All round the house the grape vines hang low and battered, failing of support and structure. The kids run under it to the front door, I duck my head but still brush the leaves. I notice colour and slight decay; maybe autumn is on its way after all. The sky is open blue, a kind of endlessness, a greatness beyond comprehension, the contemplation of which leads some to deity and others away from the story and back towards the real. I notice a spinning leaf, held on spider threat, caught by the near nothing breeze. A curled leaf sits in the middle of another web, spider home and camouflage, a design without designer, a perfection of sorts brought forth without intention. From sky to web and back again, the truth remains inexplicably simple, statable in a few sentences; the Razor remains sharp, and maybe, just maybe, autumn will begin this week. An Easter high tide, maybe even a spring tide at the start of autumn, rushes waves over afternoon beach sand and soaks bystanders on the shore. Adventure becomes misadventure and H spends some time in casualty, a black eye and three stitches his reward for my misjudgement. Silver gulls dance rapid shimmy footstep dances in the retreating waves. An evening walk to the car is collar flick cool, but not cold. When I put the kids to bed, the offer of blankets is accepted like night-time stories and familiar soft toys. I’m not sure holidays are meant to start like this. As I leave the kids to sleep, I hear a cork pop from a bottle and the liquid rattle of pouring wine, so at least the day ends as planned. It’s early in the morning and the sun is bright, but I wish I had a thicker jacket. (More evidence.) The metal of the tripod legs is cold to the touch and I can feel cold water soaking into the shoes I have only just managed to get dry from the dash to grab H. Thin, but sticky, mud pushes up around my footprint, and the more I move the quicker it moves too. But I’m trying not to move at present. I’m trying to stand still. Very, very still. There are at least 400 Banded Stilts just over the mud in front of me. A few sinking minutes ago the birds on the outer edges of the flock had looked nervous and had been looking in my direction. So, I wait and my feet get a little wetter and my hands get a little colder, and the birds settle back into their routines. Many of them are standing on one leg and I copy that stance as I slide the other foot slowly forward. I repeat this balance and slide a few times and gain a meter or two without the birds disturbing. This is close enough. I bend down onto one knee – and gather instant mud – and start shooting. A few birds look my way, but not many. Stay low. Check the settings. Click. Click. Recompose. Click. Click. Adjust. Click. Click. I suppose I could push forward a little more but decide not to. The feeling of moral superiority helps warm my feet and hands. 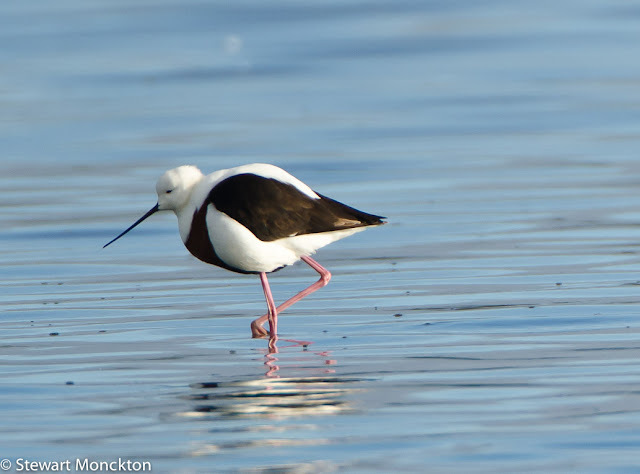 Banded Stilt are a remarkable bird. An occasional breeder when heavy rains bring brine lakes to central Australia. Waiting to breed until there is water in the desert is a classic boom and bust strategy, so different to those taken in the (formerly?) more predictable parts of the world. The long-term unpredictability of Australia is built into the behavioural DNA of this species. If you think about it from the point of view of the predictable and nutrient rich ecosystems of Europe or the Americas, this strategy seems to make no sense. But here, with floods and fires and a soil long since stripped of most of its nutrients, the value of hanging tough until good (or possibly just better) times arrive, makes sense. In many Australian years, an individual’s reproductive investment can return nothing at all. You need to invest when you get the best chance of a return. Holding off and putting your eggs in one basket makes perfect sense if in most years you can’t even build a basket. A small flock of greenshank draw me away from the Stilts, but they live up to their guidebook reputation of being shy and flush well before I can photograph them. A magpie on a fence post looks at me with a flushed red eye. It carols its under-breath call, a little nervous perhaps? Maybe even curious? Back at the car the radio talks of politics and division; maybe more people should spend time in the mud, finding things that drive away the chill of an autumn morning. The kids want to sit on the front seats – but a faster off the blocks couple beats them to the prize. I end up sat in the same seat as last time, when the boat headed to Mud Islands. This time the sea is flat and the conflict of tide and wind has abated. IIt’s not a mirror, but it’s the next best thing. The conflict of tide and wind has abated. Out past the marker buoys a few cormorants fly heavy winged over the water. The challenge of underwater hunting compromising the promise of flight. A bird by bird balance between two conflicting needs. 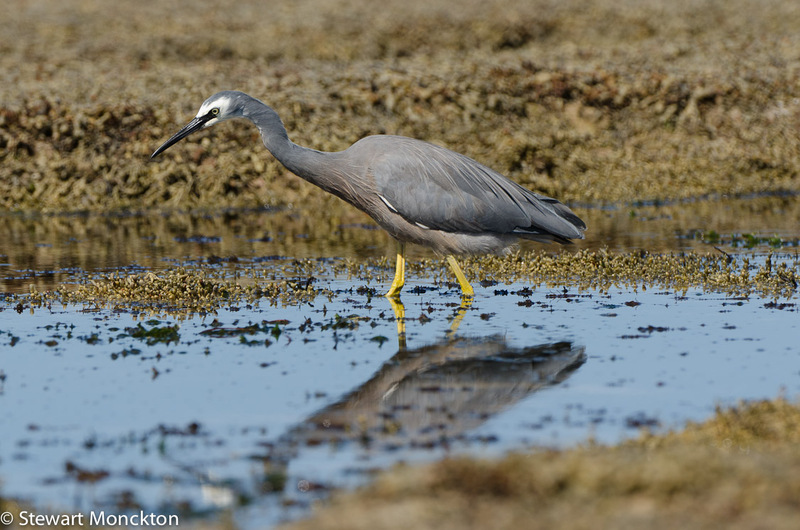 A White Faced Heron, a bird born of a different selective algorithm flies higher overhead. The cormorant and the heron are both fish eaters, and back in the distance of time they shared a common ancestor. But descent with modification, again bird after bird, has brought them to very different places. It’s a process of remarkable elegance and simplicity. A Crested Tern flies by, telling another bird by bird story. I can’t but smile at the diversify. The familiar outline of Pope’s Eye grows out of the water. A faint cloud of gannets hovers above it, snow clouds out of season, wispy white and mobile. A chick sits on the outer rocks, round, grey and fluffy. It’s a caricature of a young bird, but it’s also real. Its parents arrive at the same time and greet each other with the waving of sky pointed beaks. This is not a common thing to see. 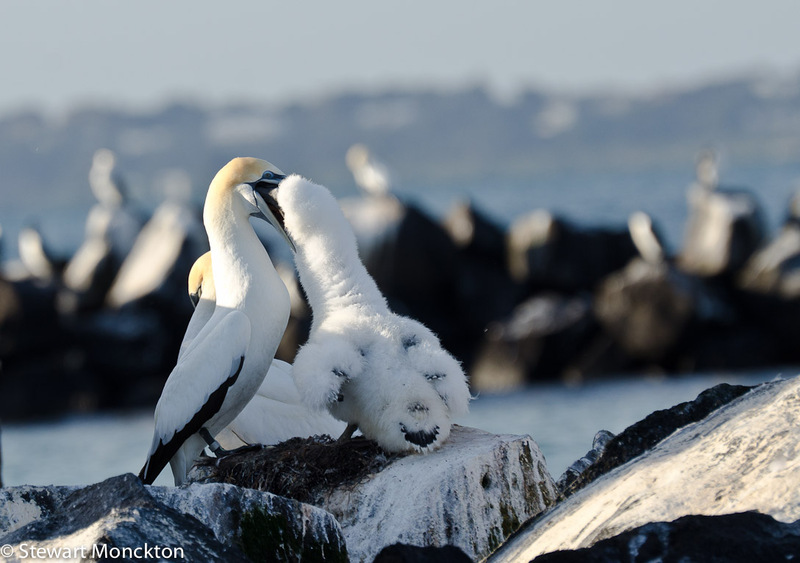 The chick, without care for parental harmony, plunges its head into the mouth of one of the birds. Slime thick liquid flows, a little spills and the chick keeps eating; drinking the product of a morning’s fishing, reliant on the skill of its parents to stay alive. There are few other chicks on the rocks. This is a late starter, a variation away from the norm. Who knows why? But this is the grist to the mill of selection. This may be the beginning of a new story if the chick lives. Or it may be the end of the story if the cold of the next morning, or the storms drifting over the horizon, come to claim a life. Inside the stone shelter of The Eye smaller birds wait in small, loose groups on the rocks. Some bear the marks of human hands – metal bands and small, bright, plastic flags. But unlike the discards of everyday carelessness, these little burdens do not harm the birds. In fact (in hope really) they may help the birds if in the end the information they carry brings human understanding and safety. Maybe. 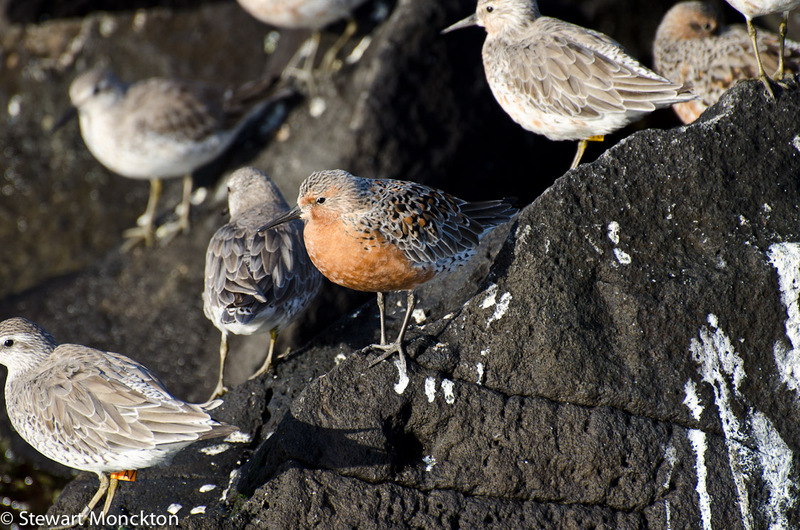 Most of the small birds are Red Knot, lingering slightly before heading north away from autumn and into the warmth of spring. Some of the males are bright already, eye catching in fresh plumage. One bird – A7 – a young male, was banded only a few miles away, so may stay a while longer than most. He could even stay all winter and only return go north next year. I’ll keep an eye open for him. Eventually I spot a couple of Ruddy Turnstones, hiding in plain sight between the Knot; none bear the tell tale sign of human interest, all seem slightly nervous. 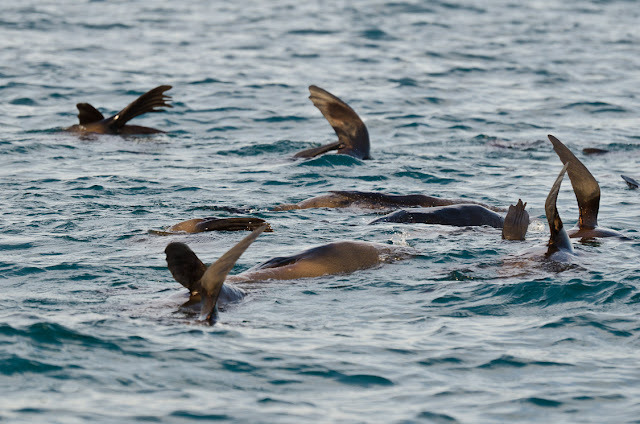 The boat heads out of the sheltered ring of stones towards the seals. My kids remember the smell. The sea is still slight, but the boat does a double back and forth rock as we enter the bay proper. Today it seems to be a swimming day for these loafing single males. Many float on the water, with a single flipper held high like a flag. Apparently they are using the flipper as a solar panel, soaking up the warmth of the sun through the dark surface of the fin and taking it away to cooler body parts in a flow of warmed blood. This explanation even sounds plausible enough to be true. A longer run over shallow water brings the boat to another artificial island. 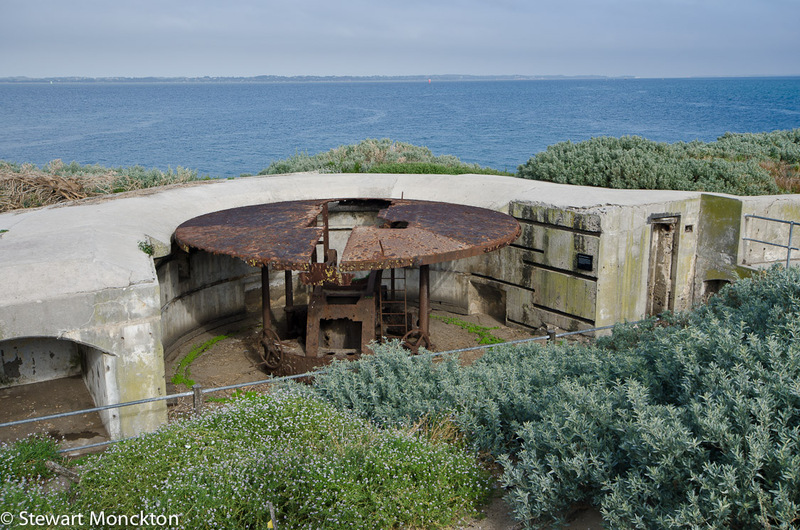 This one is called South Channel Fort – and, like Pope’s Eye, its original purpose was not benign. The deep-water channel that leads from the sea to Melbourne’s port follows a ghost of rivers past. Not that long ago, when the sea was lower and the world was colder, the river that is now the Yarra ran over grass plains towards the sea, where it met rivers that flowed from the high mountains we now call Tasmania. As these great rivers flowed south towards the ocean they cut channels and valleys in the landscape. When the sea returned these waterways and their landscapes were drowned. Now, for Melbourne at least, the way to the city for big ships follows the ghost of that river – a deeper channel in an otherwise shallow sea. And South Channel Fort was built to stop the unwanted or the aggressive from gaining that path. Built in the 1880s, the unwanted boats were Russian, and the suspected reason for their arrival was the discovery of huge amounts of gold. At that time Melbourne and Victoria were almost awash with gold and money, and the realpolitik of the time suggested the Russians might like some of it. This, of course, never came to pass and the defences were never used. So, now they sit, in a state of surprising preservation, watching over the arrival of cargo ships from China and ferries from Tasmania. The guns, which could be popped out of their hiding places by the force of pumped water, never fired at a foe. And the mines – sensing changes in the magnetic fields of the Earth made by the passage of huge iron ships – were never charged and detonated. Although it’s all a long time ago, I have to say I’m glad it was never used for its designed goal. Once it was abandoned the sand drifted into the hidden tunnels of the fort through open windows and broken doors, until the tunnels inside the island were full, and the doorways were blocked. The open water between the island and the shore kept visitors away, and the sand held back those few that came. In recent years the tunnels have been cleared of sand, but many of the doors stay locked. So now, when the vision of world risk has changed, the fort stands as a crisp reminder of days past, a reminder of a different view of the world. 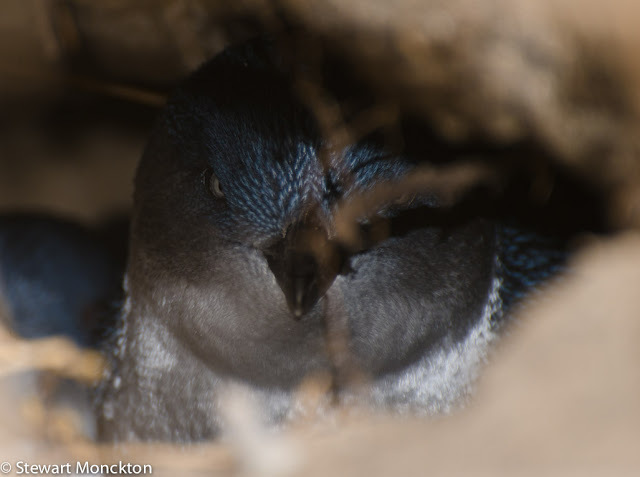 In a sandy burrow outside a double locked door a penguin waits for dusk. The white of its feathers the only clue to its whereabouts – but I still needed to be shown. A scattering of bones lies underfoot, where birds have died and some have grown. The engine coughs into life. We pull away from a dock designed for torpedo boats and head home, across an autumn sea, away from an island built so that men in the spring of their lives could die and do the will of wintery commanders. Love the pics Stew - that new lens earning its keep - simply marvelous. Autumn has been lovely, but winter is too slow and its too dry, foreboding of a nasty summer to come perhaps? I'd really like some snow this year - on the hills of course! All brill, but that heron! 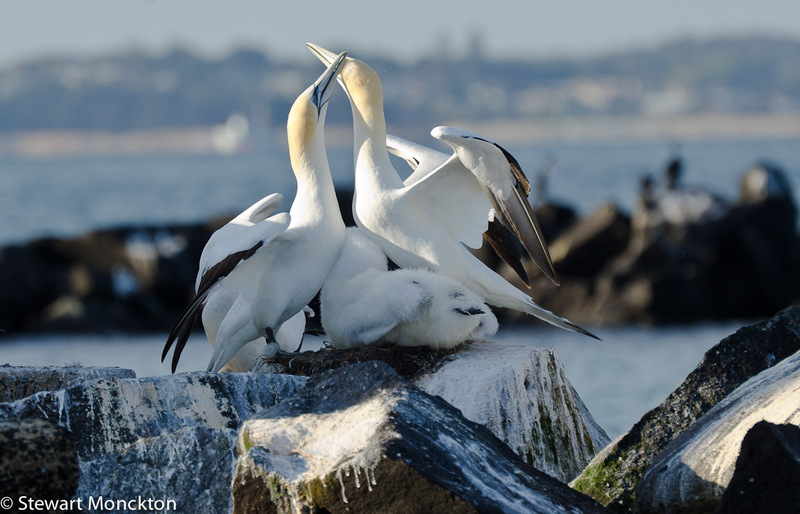 - and OOHHH, the Gannet parents meeting. Such a moment of beauty beyond the mere birds themselves and the blessing of being present for it. How the heart beats. 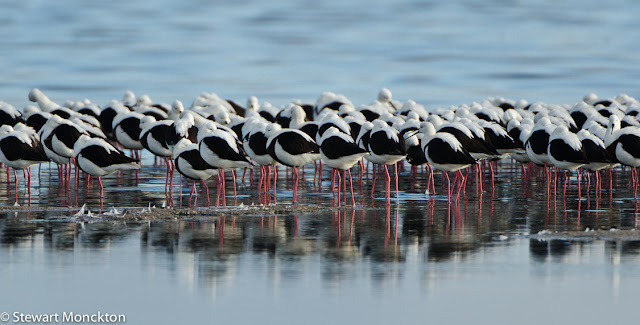 Amazing post Stewart!Fantastic pictures!Very beautiful birds!We have Spring and 30c!It's hot! !I love your new header!! Looks like you had a fabulous day, Stewart! Love the Gannett interaction photos. Always so great to see birds acting natural in the wild (vs. just posed). ...."maybe more people should spend time in the mud...."
My favorite passage in your wonderful post. Perhaps since Autumn is so late in arriving, it will be savored all the more once it does. Thank you, Stewart, for another great read while I sip coffee! Beautiful photography, there is nothing like it. Cheers Stewart. "I suppose I could push forward a little more but decide not to. The feeling of moral superiority helps warm my feet and hands. " Wow! some stunning captures here Stewart .... they deserve to be framed. Bravo! This is such a great post, Stewart! Not only the photos are gorgeous, stunning, and amazing; I feel like I'm reading your secret thought throughout the process, and at different pictures. Whoo! Lovely blog, Stewart, and superb pictures. You're on my list from now on. Great post, Stewart! Sounds like an awesome time and the birds and photos are amazing. As always, great photos and interesting narrative. Happy Birthday again. I never feel like just saying 'beautiful pictures, nice post' because there is so much content and so much to think about over here. Thanks for taking us along on your adventure. I loved reading about and seeing your birds. WOW!! Superb images, Stewart and a great story to go with it! Those Gannets are really something, aren't they? ?